The Barong Ket is a lion-like creature. His appearance in Balinese dance drama signifies a return to order and calm after the chaos imposed by the witch Rangda. 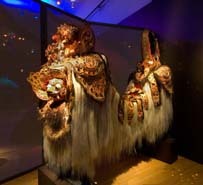 The mask of a Barong Ket costume is borrowed from Hindu-inspired sculpture while the two-person dancing body was probably inspired by the dancing lions and unicorns of Chinese festivals. The barong’s mask is consecrated to be inhabited by a spirit. During rituals and when not in use, the mask is given an honored place in a village temple. Unconsecrated masks are carved and sold to tourists. Giant three-dimensional recreations of Pterodactyls & Dinosaurs at the American Museum of Natural History are shocking enough for Pious Evangelicals who believe that there never were such animals & that the Earth as we know it is only some five or six-thousand years old! Now AMNH has gone way beyond Jurassic Park exhibitions, with the stunning new Mythic Creatures. But—you might well ask—how can Director Ellen Futter and her Merry Crew justify creating Monster Mockups of Strange Beasts that we all now know certainly never existed? Aside, of course, from providing a Great Summer Show for the kids! There are at least Two Other Reasons for this show: One is that Mankind did once very much believe in Unicorns & Dragons. And especially in Mermaids, for they were Sexier than fire-breathing Giant Lizards. No less an Authority on Nature’s Wonders than Aristotle believed in Unicorns, although he had never actually seen one. Even in the Late Middle Ages, Kings & Cardinals kept Unicorn-Horns in their personal Wunderkammern. At AMNH you can see one of these—attached to a supposed Unicorn-head. The horn, at least, is real. But it is the horn of a Narwahl, itself almost a Fabulous Fish. Before Columbus & others established that the World Is Not Flat, Navigation Maps showed the edges of the Oceans, with all kinds of strange sea-beast & serpents thrashing about, waiting to devour whole shiploads of Tasty Sailors! And because Dragons played such a large role in Heroic Myths—both East & West—pictures & images of them became an important part of Folklore. So—as the American Museum has done with specific cultures around the world—here is a colorful Chinese New Year’s Dragon! Curiously, in China and elsewhere in Asia, Dragons mean Good Fortune. But in the West, they imply Fear, Evil & Hearty Hungers for Young, Virginal Maidens! There are still "dragons" extant, as with the Komodo Dragon, an immense lizard found on a Pacific Island. The American Museum’s Dragon is 17-feet-long, however. Other fabulous creatures, like Sindbad’s Giant Roc—in the Arabian Nights—have been especially created for this exhibition. The Museum’s Roc has a twenty-foot wingspan! Then there’s a beautiful Merry-Go-Round Flying White Horse, an elegant evocation of Pegasus of Greek Myths! Reason Two for this show, however, is that there were some Fossil-Records that suggested to People & their Prophets, hundreds or even thousands of years ago, that such beasts as the Wyvern & the Gryffon might actually once have lived on this earth! Queen Elizabeth II, in fact, has inherited an entire Menagerie of Fabulous Animals. They are, appropriately, called The Queen’s Beasts! The Unknown Audubons: Mammals of North America Folder. Closed for decades, the American Museum’s Audubon Gallery has just been re-opened, restored to its former elegance. But the initial-exhibit is not of Audubon’s famed paintings of American Birds. Instead, it is devoted to some 50 striking Audubon Illustrations—oil-paintings, watercolors, lithographs—of American Animals! They were prepared for Audubon’s sequel to The Birds of America, which he proposed to call Viviparous Quadrupeds of North America. This Hunting & Drawing expedition was to be his "Last Great Adventure," but his Sight & his Mind began to fade before he could finish the project. In the event, his son completed the paintings for the three-volume work: Definitive in its time, but now, Invaluable, as some species have almost disappeared! There is also a handsome marble bust of Audubon, as well as the famous painting of him, seated by his horse & his hunting-dog, a rifle cradled between his legs. The NRA might well adopt John James Audubon as its Poster-Boy, but he never killed for mere sport. 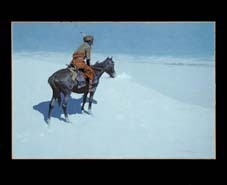 He did shoot his birds & animals, preserving their coats of feathers, or their pelts, for definitive studio-painting. Audubon sketched in Nature, but he did not finish his famed paintings in the Wilderness. Asher B. Durand (American, 1796-1886). In the Woods, 1855. Oil on canvas. While enthusiastic Environmentalists are eagerly striving to protect what is left of the American Wilderness in the West—often fighting their own elected & appointed officials—much of the Wilderness that Once Was in New York & New England has been Settled & Developed. To focus attention on the American Landscapes of Asher B. Durand at this time is, therefore, more than an Exercise in Nostalgia. Of course, it also offers the occasion to marvel at Durand’s remarkable skills as a draftsman & painter of Nature. But, in a much larger sense, the current exhibition at the Brooklyn Museum serves to remind us—not only of what we have Lost in the East over the past 150 years—but also of the raw Natural Beauty that is now in peril of destruction or despoliation. An outstanding attraction in the Durand show is actually rather small. This is Durand’s Kindred Spirits—long a treasure of the New York Public Library. Even in its small scale, it is breath-taking as it poses two Famous Americans on a rocky-ledge, looking over a Primal American Wilderness scene. The two sympathetic figures are the distinguished American painter, Thomas Cole, and the much-admired 19th century American poet, William Cullen Bryant. He was the author of Thanatopsis, which begins: "To him who in the love of Nature holds communion…"
Bryant, Cole, and Durand obviously all held communion in the love of Nature. Kindred Spirits was sold for millions to Fay Walton, one of the fabulously rich Wal-Mart Heirs. Now it has briefly returned to New York from its new home in the Crystal Bridges Museum of American Art, located in historic Bentonville, Arkansas! Asher Durand was the quintessential painter of the American Wilderness, so it’s good that the Brooklyn Museum owns some of his works, as well as those of Frederic Church, Albert Bierstadt, and other 19th century painter-poets of American Scenes. Durand’s important The First Harvest in the Wilderness was transferred to the Brooklyn Museum from the Brooklyn Institute of Arts & Sciences—BM’s fore-runner. The Institute was the only one in America at that time to commission works from Living Artists to build a Permanent Collection. First achieving prominence as an engraver—his engraving of Trumbull’s The Declaration of Independence is still regarded as a masterpiece of its kind—Durand moved on to portraiture. The current retrospective includes Durand’s Thomas Cole. Durand finally settled on Landscape Painting as his métier, He was soon acknowledged as the Dean of American Landscape painters. His finished canvases were done from plein air sketches, watercolors, & oil-studies made in Nature, but refined in his studio. Some of these masterful—if minor—images are on view in Brooklyn, mementoes of trips to the Catskills, the Adirondacks, & the White Mountains. This show opens 14 September at the Smithsonian in Washington, DC, followed by a 2 February 2008 opening at the San Diego Museum of Art. Appropriately, the Brooklyn Museum’s new Sackler Center for Feminist Art has been designed by a woman: no less an architectural-talent than Susan T. Rodriguez, of the Polshek Partnership. As Rodriguez says: "The design of the new Center creates a visually distinctive environment symbolic of the Museum’s commitment to creating a permanent home for showcasing Feminist Art & recognizing & exploring the importance of a woman’s point of view." The obvious Visual & Spiritual centerpiece of the new Center—and possibly of its Agenda, as well—is Judy Chicago’s Dinner Party, which the Brooklyn Museum has had in storage for some time, waiting for this Special Space to be created. "The overall design is conceived as a series of concentric layers: the perimeter walls of the 19th century building, the enveloping zone of changing exhibit-galleries, and the walls and inner sanctum of The Dinner Party gallery. This strategy serves to reconcile the scale and geometry of The Dinner Party within the structure of the Museum. "An equilateral triangle in plan, the geometry of The Dinner Party gallery forges a vital relationship between the art and the space it occupies, which is intended to heighten the visitors’ perception of the piece and to reinforce the artist’s original concept. At the same time, the triangular geometry is in pointed contrast to the rectilinear geometry of the Museum’s historic structure…"
Your correspondent unfortunately experienced Judy’s Last Supper for Famous Feminists before he read the remainder of Rodriguez’ Statement. 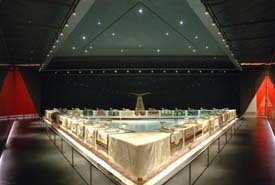 The Dinner Party, 1974–1979Mixed media: ceramic, porcelain, and textile, 48 x 42 x 3’ (14.6 x 12.8 x .9 m) Brooklyn Museum, Gift of the Elizabeth A. Sackler Center Foundation© Judy Chicago. Having long ago seen The Dinner Party in San Francisco & other major venues—as well as previously at the Brooklyn Museum—I thought I must be going blind on this renewed acquaintance with the Place-Mats & Ceramic Vaginas of Hatshepsut, Georgia O’Keeffee, Emily Dickinson, & Susan B. Anthony. Initially, it was so dark that I almost bumped into one side of the table. I did, in fact, collide with a TV-camera-man, intent on recording Chicago’s Banquet-Feminism for the Six o’Clock News. But here’s Rodriguez’ enlightening explanation: "…light-levels diminish [italics added, ed.] as the viewer moves from the surrounding galleries into the permanent exhibit." Some of Chicago’s place-mat/napkin Needle-Work—if she did not farm this out to Chinese-embroiderers, in the manner of Jeff Koons, having real artisans create solid works from his sketches—are worked in fascinating detail, each relating symbolically to the Famed Dinner-Guests. Viewers should be able to inspect this intricate work easily, without flashlights or magnifying-glasses… Otherwise, there is the Distinct Danger that one visit will be enough for Brooklyn Museum Regulars. Can you justify building an entire gallery-complex around one soi disant Artwork that may already have exhausted its Novelty, if not its Symbolicity? Two Final Questions: 1] What if Judy had chosen to call herself Albuquerque? Or Kansas City? 2] What other famous Artworks do you associate with the name Judy Chicago? Incidental Intelligence: There’s a more recent Allied Artwork-Installation, clearly inspired by The Dinner Party, featuring small covered-wagons drawn round in a circle. Atop the wagons are Place-Settings for the infamous Donner Party. Caught & trapped by early snows at Donner Lake in the High Sierras, the Emigrant Donner Party had hoped to reach California before Winter. As they starved, froze, & died, some resorted to Cannibalism! Some Dinner Party: Dinner with the Donners! Changing Dinner to Donner, ingenious installation-artist Jim Shaw conceived of his The Donner Party way back in 2003. It is currently on view—not at the Brooklyn Museum—but out in Long Island City at P.S.1. Three works from the Bind series, 2001 Lambda print, 78 3/4 x 57 1/8" (200 x 145 cm). Tokyo Metropolitan Museum of Photography (Photo: courtesy of Zeit-Foto Salon, Tokyo). Life-Cycles, Identities, Politics, & Emotions are the four Organizing Principles of this tendentious exhibition. Some of the works on display are more notable for their concern with Feminist Issues than with any impessive exercise of artistry. Maybe she should have tied Lt. Pinkerton up with pig’s intestines? But then both David Belasco & Giacomo Puccini—Butterfly’s creators—were Men. Yoko Ono surely would have done it differently. Was Yoko in this show? I couldn’t find her listed, but perhaps I did not look closely enough? Head of a Ptolemaic Queen 305 B.C. - 30 B.C. Ptolemaic Period Marble 5 1/2 x 4 3/4 x 4 1/2in. (14 x 12 x 11.5cm) Charles Edwin Wilbour Fund. The Myths that surround Ancient Egypt’s Hatshepsut—"The Queen Who Was a King"—are explored visually & textually in this challenging exhibition. Having recently myself photographed many details of her Mortuary Temple on the Western Side of the Nile—when Pharaoh’s died, they Went West—I found the artifacts in this show especially interesting. But its not all about Hatshepsut. Queen Tiye is included, along with a possible head of Cleopatra VII. Not to overlook several female Egyptian Goddesses, notably Isis. To complete the Judy Chicago tie-ins with other shows in this new space, Judy’s Hatshepsut dinner-plate is represented by both a drawing and a ceramic test-plate! The Cults of the Female Goddesses in Pharaonic Egypt still conceal Mysteries. The heads of Hathor, the Cow-goddess—are multiple capitals on the columns of Hatshepsut’s temple. When Moses—or Charlton Heston—was up on the Mountain, receiving the Tablets of the Law, his People were on the plains below, making an image of a Golden Calf, as the Old Testament reports. Surely this was not some new God-of-the-Moment, but, in fact, the Goddess Hathor, so widely worshipped in the Egypt they had just fled! The Pointillist painting-techniques of such French Innovators as Paul Signac & Georges Seurat are now fairly familiar to gallery-goers, especially those fans of Stephen Sondheim—who much admire his musical, Sunday in the Park with George, based on a single Seurat Pointillist painting. Few, however—aside from Curators & Art-Historians—understand the Color-Theories that gave rise to such techniques & fascinating optical-experiences on canvas. But these theory-driven French artists were not the only painters who were searching for techniques to separate the various colors in the spectrum, rather than blend them into one broad stroke. The North Italian Divisionists did take cues from their French counterparts, but they developed their own systems of optics & chromatics in which distinct colors were laid down on canvas in hundreds & hundreds of mosaic-like tiny brush-strokes. Seen from a moderate distance, these strokes blended to give the magical impression of a shimmering scene. The Spectator’s Eye blended the colors: not the painter, with colors mixed on a palette & daubed on the canvas.. But this blending was not the only benefit of the tiny strokes: they also intensified the effect of individual colors! The Guggenheim’s challenging show juxtaposes some of the French Pointillist Masterpieces with some largely unknown—at least to most Americans—Divisionist works by such talents as Emilio Longoni, Angelo Morbelli, Gaetano Previati, & Giovanni Segantini. This is the first exhibition to put the Divisionists in the context of Western European Neo-Impressionists, such as Pissarro, Seurat, Signac, & Theo van Rysselberghe. What sets the North Italians somewhat apart, however, is their Left-Leaning & Quasi-Symbolist impulses. Thus the title: Arcadia & Anarchy. The show has five sections, beginning with Light, so important in the way colors were applied when depicting Interiors. Landscape, however, is still about Light, but Sunlight, as it illuminates the land & is reflected from seas, river, & lakes. Rural Life & Social Problems deal with physical-labor & difficulties in daily-survival, but the shimmering mini-strokes of color often soften harsh realities. The final section, Symbolism, illustrates the allegorical or spiritual-escape from such realities by some of the Divisionists. Inter-Planetary & Inter-Galactic Space are almost impossible to conceive visually—though Cinematic Artists have certainly made ingenious efforts in Star Trek & other celluloid-epics. But Spaces need not be Vast Voids. They can, in fact, define Perimeters & Containers. Through this summer, the Guggenheim will be exploring various ways artists—Painters, Sculptors, Architects, & Installationists—have attempted to Show, Suggest, Define, De-limit, De-mystify, or Outline Space & Spaces. The inspiration for this serendipitous show—which inexpensively draws on the Guggenheim’s Permanent Collections—is the on-going Restoration of the fabric of the actual Museum, specifically the Frank Lloyd Wright Rotunda. So when you next visit the Guggenheim, look for The Shape of Space, conceived by Alyson Shotz. You should also expect to find a canvas by Vasily Kandinsky, as the museum has a hoard of his works. Not to overlook Naum Gabo & László Moholy-Nagy! In late June, Pipilotti Rist’s Himalaya’s Sister’s Living-Room (2000) is promised, as is Rirkrit Tiravanija’s Untitled 2000 (he promised) (2000). Frank Lloyd Wright was already dead when his Monumental Post-Pharaonic Art-Mausoleum opened in October 1959. Its design was a wonder, notably the Signature Spiral-ramp in the Guggenheim’s Rotunda. This—and its stunning Exterior, seemingly stacked decreasing rings of Shotcrete—made the new art-facility look more like an Architectural Sculpture than a Form-Follows-Function space for showing planar & three-dimensional artworks. That has been an ongoing Exhibition-Problem, variously overcome. But the innovative manner of filling the voids in the steel & plywood forms for the Rotunda Exterior—never before used on this scale or with such an important structure—did not address future problems of material-decay & disintegration. Shooting streams of the cement & gravel-based Shotcrete from the inside into the forms was a Fast-Fix. And much less expensive than forming the Rotunda Shell & Ramp from poured-concrete. Patching & repainting the Guggenheim Exterior over the years has not solved the problems of cracks & fissures, or of concrete-deterioration. So a Massive Restoration has been necessary. This exhibition documents the ongoing efforts to stabilize Wright’s Last Masterpiece. Photographers & Amateurs who prefer slide & print film to digital-images are in trouble. Those who very much prefer Kodak films to Fuji are in even more difficulty—even if they are not yet aware of that fact. Digital-cameras—especially those embedded in cell-phones—are swiftly replacing traditional 35mm film-cameras. While you can still find packages of 24-exposure Kodak film at your local Duane Reade or Walgreens, you won’t find any 36-exposure rolls at all: Most people only want to take some snaps of family-events or vacation-trips. No Photography-Marathons! As for finding slide-film—either 24 or 36-exposure 35mm—forget about it. Unless you go to a real Camera & Photo shop, you won’t find it anywhere. But photo-shops would much prefer to process your digital-images into color-prints, even though that proves more expensive than two-prints-for-every-image, plus negatives & a CD of your exposed film-roll, on offer at many Manhattan Souvenir Shops. Nor will you find Kodak slide-developing envelopes so easily anymore. Kodak film-factories & film-developing labs are rapidly being phased-out! Tacita Dean—Hugo Boss prizewinner for 2006—has won recognition as an artist through her own photographs & 16mm films dealing with the Sense of Loss: Themes of Memory, Obsolescence, History, & Relics. Dean began to realize her own 16mm film-making was in serious trouble when she discovered the French Kodak Factory in Chalons-sur-Saône was closing its 16mm film-production facility. So she asked permission to document the End of a Photographic Era. Her 44-minute 16mm film, Kodak, is the result: a filmic-meditation on Engineered Obsolescence. There is also Found Obsolescence—a section of unfinished, unexposed film-in-production. Plus the abstracted black-&-white film-projection, titled, appropriately, Noir et Blanc. Also on view is Majesty (portrait) (2007), one of a series of Dean’s tree-photographs which she heightens by painting-over background details. Louise Nevelson, First Personage, 1956, painted wood. The Sub-title for this Nevelson Retrospective at the Jewish Museum applies equally well to Nevelson’s Found-Object Constructions & to her forceful construction of her Own Personal Legend. Indeed, a video-documentary on view shows Nevelson at work on a new piece, with both legends intertwined & being actively advanced. Much has been written about Nevelson’s Black-Box-Assemblages, both astringently critical & humorously superficial. But an ongoing-problem for some commentators has been her proper Artist-Classification: Surrealist? Feminist? Minimalist? Cubist? Installationist? Nevelson is a gift to Art-History students in Instant-Identification slide-show Exams: There is nothing else quite like a Nevelson, be it Black, White, or Gold. It should even be fairly easy to spot a Nevelson-Imitation, alongside the Real Thing. Is there an American Museum that lacks its own Nevelson? Not all Nevelsons are small & compact. Her white 1959 Dawn’s Wedding Feast—created for a MoMA show has been recreated at the Jewish Museum with loans from no less than 12 museums & private-collections. Also on view: Mrs. N’s Palace, a large black construction suggesting a house with a mirror-floor, as well as Homage to 6,000,000, a vast wall of a work evoking the Holocaust. This is on loan from Osaka’s Museum of Modern Art. 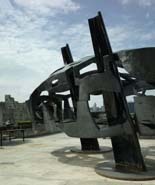 Black was Nevelson’s preferred sculptural-color, possibly because whatever kind or amount of light fell upon a work, the diverse elements seldom stood out. Painted White, they were more clearly defined, especially by their shadows & profiles. Gold turned them into more weighty Solids: as if they had been cast or lathed from Golden-Ingots. Richard Avedon’s 1975 striking portrait-photo of an ageing, black-clad Nevelson—clutching clunky necklaces & topped with an elaborate wide-brimmed black hat—is Iconic. Her gaze is direct, unflinching, almost accusing. But in earlier images, Nevelson reminded me of another Self-Constructed Legend—whom I long ago met on her front-porch, on the Main Road from Copenhagen to Elsinore: Karen Blixen! View of the Sylvia Josephs Berger and Joyce Berger Cowin Gallery, Augustan Rome, first century A.D.
Actually, the Met Museum has more accurately labeled its former Atrium-Cafeteria space as the [New] Hellenic, Etruscan, & Roman Galleries. The Attic Greek and Greek Pre-History vases, sculptures, & fragments remain where they have long been on view: in the long atrium-corridor & side-chambers, leading to the renovated Atrium Galleries. Although some Met Regulars continue to grumble about the loss of this Noble Space as a mid-day Eating Experience, the food was never that good. And the wait for a table was often enervating. Nonetheless, for admirers of the distinguished Modernist Swedish sculptor, Carl Milles, the loss of his elegant fountain-pool—with sleek bronze boys scooting on the surface—is to be regretted. There is, however, a duplicate in the Milles-Garden in the Stockholm suburb of Lidingö. What an amazing Treasure-Trove of Classical Sculpture the Met has found in its vast store-rooms! Now on view are some 5,300 statues, vases, tablets, mosaics, sarcophagae, architectural-fragments, wall-frescoes, votive-images, decorative-objects, mirrors, gems, & jewelry that have not been seen by the public for many decades. Some of these priceless works were acquired shortly after the 1870 founding of the Metropolitan Museum of Art, no less. But there was no place to show many of them, the nutritional needs of Met visitors being more important in recent years. It is said that the Met—like other major museums—never has more than ten percent of its actual collections on view at any one time. Having once written a feature on what is down in the Met basements, I can attest to the hordes of artworks & artifacts artfully stored, both to protect them & yet make them accessible for scholarly-study. 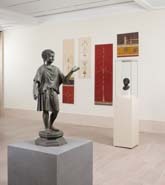 In fact, there are important Study-Collections included in the new Galleries. These are on display in side-galleries and up on the second-floor. Many Met visitors will be content with gawking at the profusion of large sculptures in the Atrium Court. But the special-exhibits—which require careful-inspection & close-attention, if their delicate-artistries & cultural-significances are to be properly appreciated—should not be overlooked. For many, the Star of the New Galleries is the ancient Etruscan Chariot, some of its rich gilding still clinging to the handsomely worked metal-surfaces, depicting scenes from the Life of Achilles. This is one of the very few ancient chariots to survive, but it has not been on view since the early 1990s, when it was withdrawn for study & conservation. It dates from the Sixth Century before Christ, so its survival in such comparatively complete condition is amazing. Fortunately, the Etruscans—somewhat like the Ancient Egyptians—often interred more than just the Corpses in Noble Graves. How about a Chariot-ride through Hades, with Achilles himself holding the reins? Attributed to Lorenzo Bastiani (Venice, 1449-1512). Portrait of Doge Francesco Foscari. Not that Venice was a Law Unto Itself, but after the effective collapse of the Roman Empire, neither the Pope nor the so-called Holy Roman Emperor was in a position to impose Unity on the separate states of the Italian Peninsula. A Papal Interdiction against trading with the Ottoman Empire or other Muslim Fiefdoms did not deter the Doge nor the sea-going Venetian Merchants from doing Business with Turks, Persians, & Arabs. Of course, The Venetian State was not the only so-called Maritime Republic in Italy. There were also those of Genoa, Amalfi, & Ragusa—today’s Dubrovnik. But Venice & her powerful fleets were the most important of all traders with the Middle East & the Far East, far beyond. Not to overlook the Conquest of Byzantium & the defeat of Eastern Orthodox Christianity by the Turks, who over-ran much of Southeastern Europe, until they were turned back at the Gates of Vienna in 1693. The wily Venetians rode the crest of the waves of the Mediterranean, bringing spices, perfumes, silks, carpets, artworks, & crafts from East to West. As well as Western goods, bound eastward. But goods, foods, & raw-materials were not the only imports. Venice also fostered an effective exchange of artistic ideas between East & West. The flow was more to the West, as the exhibition demonstrates. It had marked effects on such things as armor & weaponry, art-metalwork, ceramics, glassware, printing, book-binding, patterns, designs, weaving, & even calligraphy. There are some 200 artworks on view in this exhibition, borrowed from more than 60 "public & private collections," as they say. Most of the objects or artworks on view are worthy of notice quite apart from the context of this show! In case you are puzzled by the bracketing-dates of Venice & the Islamic World, trade did not begin in 828, nor did it end in 1797—although Napoleon Bonaparte conquered the Venetian Republic in that year. In 828, two sly Venetian merchants stole the Holy Corpse of Saint Mark the Evangelist from its sanctuary in Muslim-controlled Alexandria, bringing it to his Titular-City, where it could find a final resting-place in the Duomo of San Marco. 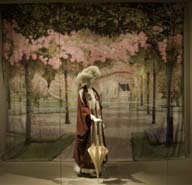 ‘Révérend’ Coat worn by Jeanne Boivin-Poiret, 1905. Actually, some of Poiret’s more flamboyant patterns & designs could pass for Art Deco, but more of them relate to the previous Art Nouveau Style. But Poiret was also influenced by the Jugendstil designs of the Wiener Werkstätte, whose visual-impulses spanned both styles. Poirtet is credited for freeing fashionable French women from the Constricting Corset. But he then devised the Hobble-skirt, which inhibited their movement in other ways. But what would Parker Posey have worn to the Gala, if the fashions of Vivienne Westwood were on view instead? Fortunately for the Upper East Side Elite, Dame Vivienne’s Punk, Witch, Pirate, & Savage fashion-lines are only on view in North America at San Francisco’s Michael H. de Young Museum! 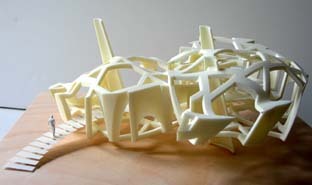 Chinese Pavillion (in progress, 2007). Something of an Extension—if not a side-bar—of his new gallery-exhibition downstairs, Frank Stella’s monumental Met summer Roof-Garden sculptures demonstrate powerfully his shift from Painting into Architecture. But neither of the major carbon-fiber & stainless-steel structures is Architecture as We Know It. Indeed, both memantra & adjoeman are strange but solid Visual Abstractions. The ship with walkway (model), 2004. Well, this title says it all, doesn’t it? But, to be Perfectly Frank, Stella’s stellar-achievement at the Met is that he is having not one, but two, First Solo Exhibitions there. More often, you will find him over at MoMA—where, every time they enlarge the exhibition-spaces to show more of the Permanent Collection, he manages to expand the size & scope of his artworks to fill the new spaces. The two-dimensional to three-dimensional Progression on view is illustrated with Sunapee II, an oil-painting with a shaped canvas, succeeded by his idea for an as-yet-unrealized Culture-Park in Dresden: First Model Kunsthaus Dresden. And then there are three models for Chinese Pavilion, the one on the roof being so enormous that not even MoMA could find a corridor long enough to show it. But isn’t it a stretch to call the Pavilions Architecture? Aren’t they, rather, leaf-inspired abstract sculptural-objects? Die Flamme [The Flame], 2007. Oil on canvas. In keeping with the current practice of commissioning Trendy Artists to create Museum-Quality works for special-spaces & special-occasions, the Met invited the super-trendy ex-DDR artist, Neo Rauch, to fill a rear-gallery with spontaneous-paintings. This he has done so well that a canvas or two has spilled over into the large light-filled adjoining gallery lined with authentic Modern Masterworks. Whatever you may think of Rauch’s Vision, it is certainly Museum-Quality by definition, as these odd canvases were, after all, commissioned by the Met! Born & still living & working in Leipzig, Neo Rauch grew to manhood under the malevolent influence of such Taste-Makers as Walter Ulbricht & Erich Honnecker, Communist Honchos of the so-called German Democratic-Republic—or DDR, in East German. Deconstructing his name, Neo means New, and Rauch means Smoke. But his visions are not all Smoke & Mirrors. The Scout Friends or Foes. If you think you have already seen a number of the Masterworks from the collections of the two rival Clark Brothers—now on view at the Met—chances are that you certainly have. Some of these canvases are Iconic Images by such Masters as Matisse, Monet, Renoir, Degas, Cézanne, Picasso, Seurat, & Pissarro, not to overlook such Americans as Winslow Homer, Thomas Eakins, & Edward Hopper! Both brothers were Singer Sewing-Machine Heirs, which made it possible for both of them to collect some of the finest 19th century French Impressionists, as well as American Moderns. But their Parallel Passions for collecting Modern Art did not include the Passion of Brotherly Love. Intensely private, Robert Sterling Clark was creating a Museum Collection: ultimately installed in the Sterling & Francine Clark Art Institute, in Williamstown, MA. Brother Stephen Clark, on the other hand, was an outgoing, dynamic Public-Presence. He founded the National Baseball Hall of Fame in Cooperstown, the family’s home-town. And he was a board-member of MoMA & the Met Museum. During his lifetime, Stephen Clark gave important paintings to various American museums, but the bulk of his collection, on his death, was divided between the Met & Yale University, his alma-mater. So you could have seen some of these paintings previously at the Met. Or if you have gone up to New Haven to visit the Yale Rep & the Long Wharf Theatre, a visit to the Mellon Gallery & the Yale Art Gallery may have offered the occasion to view a Clark donation. Then again, if you have gone to the Williamstown Festival, what else is there to do between shows but go to the Clark Art Institute? When you next go to the Met, do not miss this stunning show: But note how many of the paintings you already know: Old Friends, thanks to the Brothers Clark! Erich Heckel (1883-1970). Seated man (self-portrait), 1912. Fred Ebb dead now seems strangely still alive. Not only because the new Kander & Ebb Musical, Curtains, is a Broadway Hit, but also because his discriminating Collector’s Taste in Austrian & German Expressionist drawings emerges so vibrantly in the new Morgan Library show. Inspired both by the success of the Kander & Ebb musical, Cabaret, and by the seamy Between the Wars Mittel-Europa it evoked, Ebb began to collect drawings & portraits from the period by such Expressionist Masters as Otto Dix, George Grosz, Egon Schiele, Oskar Kokoshka, Max Beckmann, & Ernst Ludwig Kirchner. All 43 of these master-drawings that Fred Ebb left to the Morgan are on view in this show. They not only suggest the sordid Berlin of the Weimar Republic & the Rise of the Nazis—chronicled in Cabaret—but they also demonstrate the cynical/satirical vision of their various creators. Serendipitously, there is also another new Broadway Musical that springs from the same seamy Expressionist Soil as Cabaret: the Kurt Weill/Lotte Lenya bio-musical, LoveMusik. Recently, the Met Museum presented some sardonic Weimar Era portraits, as well. And Schiele, Dix, Beckmann, & Co are often on view at the Neue Galerie—which celebrates Austrian & German Expressionism. Stunning & Iconic Portraits by photographer Irving Penn—of such artists as Salvador Dali, Arthur Miller, TS Eliot, Aaron Copland, Pablo Picasso, Alberto Giacometti, Truman Capote, & Georgia O’Keeffe—have been acquired by the Morgan Library & Museum. Penn has personally given the Morgan 35 photo-portraits, with the remaining 32 purchased with income from the Morgan’s endowed funds. St. Michael Slaying Dragon, Christ in Majesty Above. A major problem in displaying the Morgan Library’s priceless & beautifully-bound Illuminated Manuscripts is that only two facing-pages can be shown at a time. And some bindings are so old & fragile that they shouldn’t even be exposed in a case for the length of an exhibition. Fortunately for the Curious, the Pious, & the Superstitious, the famed Spanish Las Huelgas Apocalypse manuscript had to be taken-apart so its colorful & mysterious images could be copied for an impressive facsimile-version. Thus, fifty of the original manuscript Religious Miniatures will be on display, in their original bound-sequence. If you want to know What Hell Is Like, you may find some clues in these images! Angels & Demons contend. The Lamb of God safely grazes, a Cross under his right front leg! This should be a Powerful Attraction for Born-Again Christian Fundamentalists, especially those who are Sure they will snatched up into Heaven in their Perfect Physical Bodies when the Rapture Occurs! The Biblical Apocalypse of the Book of Revelation is also the compelling & mystical subject of other fantastic illuminations from the Morgan’s extensive Medieval Collections. There are Illuminations from French, Flemish, & Russian Orthodox traditions as well. What is especially astonishing at the Morgan is that viewers are invited to touch the actual vellum-like pages of the facsimile Las Huelgas Apocalypse! 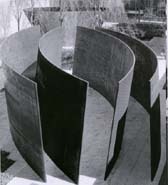 Richard Serra Sculpture: Forty Years. MoMA. Walking among—or inside—some of Richard Serra’s immense rust-patinaed, curved, torqued standing-sheets of steel-on-edge, one may have the momentary feeling of looking up at the detached prows of Abstract Post-Modernist Ships. Federico Fellini’s fausse Ocean-Liner in La Nave Va came to mind… But MoMA’s Sculpture Garden is hardly a Shipyard, so the two immense Serras on display there dwarf everything else. They are Intersection II & Torqued Ellipse—which actually photograph better from overhead. This you can do from the high-terrace in the new MoMA Extension, overlooking the garden. In the Second Floor Contemporary Galleries, the sense of Undulating Disorientation becomes even more overwhelming than in the garden. Here are such huge inter-related works as Band, Sequence, & Torqued Torus Inversion. The Mystery is HOW MoMA’s Exhibition-Crews got the curved steel-sections into the gallery & set them up. It is clear that MoMA Director Glenn D. Lowry had alerted his prize-winning Japanese Architect to design floors that could support such great weight. On the Sixth Floor, you can behold such Vintage Works as Serra’s Belts & To Lift, both made of Vulcanized Rubber. The Serra Belts—hanging in a row along a wall, like huge harnesses—are, by now, almost a Serra Signature. A number of the smaller Serras here are of Lead, not his now Trademark "Weatherproof Steel." Considering the aggregate-weight of Serra’s Lead & Steel sculptural/structural-abstractions, they are not to be lightly dismissed. Although you might want to brace yourself when you are in the core of a Serra Torque or Ellipse—if Vertigo seizes you—Do NOT Touch the rusted-steel! Your greasy, sweaty fingers could easily discolor the oxidized-metal & Ruin the Visual-Effect. It is unfortunate, historically—considering all the bits & pieces of smaller, older works strewn about the Sixth Floor—that some cut-up sections of Serra’s Tilted Arc could not also be shown. At least Richard Serra now has a Monumental Four-Decade Retrospective to validate his Visions & Dreams! Projects 85: Dam Perjovschi. Detail of work by Timotei Nadasan and Dan Perjovschi. In line with those quasi-Performance/Installation-Artists who create or construct site-specific artworks in museums or galleries—like Felix Schramm, who is taking two floors of SFMoMA to build a visual-commentary on the site—so also is NYMoMA encouraging this form of semi-spontaneous On-the-Spot Art. Beginning in April—and continuing through this summer—the wildly comedic/satiric/cartoonistic Romanian artist, Dan Perjovschi, is covering MoMA’s great Atrium Wall with his bold-stroke black drawings. Dan Perjovschi honed both his skills & his talents in Communist Romania, gaining an especially devious-edge under the Malign Dictatorship of Nicolae Ceausescu. But he got what was coming to him: Ceausescu, that is; not Perjovschi, who has even better things in store for him than his current MoMA Gig. There is even a free newspaper of Perjovschi’s boldly black-&-white cartoons for everyone who comes to see his work—and him at work. How about a cartoon showing a house crammed to the rooftop with Appliances, while the owner turns away a Homeless Man? 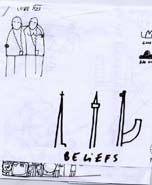 Or BELIEFS—which shows three thin spires: a Christian Steeple, a Muslim Minaret, & the Barrel of a Kalishnikov? When Generalissimo Francisco Franco launched his Falangista Attack on the legally-elected government of the Spanish Republic in 1936, President Franklin Roosevelt announced America’s Neutrality in the deadly conflict that was to prove the prelude to World War II. A year later, Roosevelt even imposed an Arms-Embargo. This only hurt the Republican Forces, as Franco’s troops were supplied by Hitler & Mussolini—who even sent their own Air-Aces to bomb Guernica & Granada, among other targets. Effectively, the German & Italian Fascists were battle-testing their own weapons in preparation for Invasions in Eastern Europe & the Mediterranean. But most of America remained staunchly Isolationist, when not outright supportive of the German-American Bund or Marshall Bagdolio’s Italian incursions in North Africa. Considering America’s Post-World War II eagerness to go to war in such distant lands as Korea, Vietnam, Kuwait, & Iraq, comparing Then with Now offers some chilling Insights. For those who may have forgotten—most of them are dead, by now—or those too young to know about the Spanish Civil War, the new exhibition at the Museum of the City of New York will be very instructive. Not only did such celebrities & artists as Martha Graham, Paul Robeson, Langston Hughes, Gypsy Rose Lee, Marion Anderson, & Dorothy Parker seek to win support & donations for the Republicans, but a number of Left-leaning Union-members, academics, journalists, students, & Depression-Unemployed volunteered for the Abraham Lincoln Brigade, which fought the Falangists. And there were other so-called International Brigades from other countries. Even in the 1950s, their Peoples’ Songs—recorded on the Discos de las Brigades Internationales—thrilled college Liberals. But there was a Price To Pay. If you were not already killed or wounded in Spain, after World War II, you could find yourself in Serious Trouble with the FBI, the House Un-American Activities Committee, & Senator Joseph R. McCarthy and his Red-Scare. The problem was not only that some American Conservatives thought Franco had done a Good Job of Restoring Order in Spain, but that the International Brigades were sponsored & supported by the Soviet Union. Ooops! Just as the Whitney Museum, dedicated to the American Artist, invoked the artistic-influences on artist-Americans of Pablo Picasso last fall—permitting it to show some really outstanding & innovative Modern paintings alongside some much paler domestic efforts—so also has the Neue Galerie, dedicated primarily to German & Austrian Expressionists, invoked the Influence of Vincent Van Gogh. Considering that, in his own time, Vincent couldn’t sell any of the paintings we now acknowledge to be Modern Masterpieces: that he died almost unknown & unmourned: how did it happen that he became posthumously such an important model for Vasily Kandinsky, Max Pechstein, Oskar Kokoshka, & Emil Nolde? You will find the answers—and resoundingly colorful demonstrations of the Van Gogh Influences—at the Neue Galerie. Obviously, none of the Austro-German artists on view spent time with Vincent in Arles. Instead, they discovered his work in exhibitions in Munich, Vienna, Berlin, & Dresden! In the Wall Street Journal, critic Terry Teachout aired his wicked opinion about the Schieles, Dixes, & Kirchners on view at the Neue Galerie: In effect, that the real value of Second-Rate Art is that it shows how good First-Rate Art is! An important Socio-Historical Visual Research-Resource—now on file in the bowels of the New York Public Library—is currently showing the Tip of its Image-Iceberg at the Library of Humanities & Social Sciences. This is the Midtown Y Photography Gallery Archive, bequeathed to the New York Public in 1998. When Larry Siegel founded the Gallery at the Midtown Y, in 1972, there were still few exhibition-venues for young, emerging, or virtually-unknown photographers. Indeed, the exhibition offers a Time-Line of the relatively late development of Photography as a recognized Art-Form. Now, however, vintage prints by Ansel Adams, Richard Avedon, or Irving Penn can command astonishing prices at auction. From the evidence of a number of prints on display, some Emerging Photographers seemed to be Just Taking Pictures of New York & its People. There is little conscious artistry in Composition, Lighting, or Cropping. Sometimes, however, the artistry is apparently Unconscious, but artistry just the same. Your scribe has worked—as a writer/critic—with some of the Midtown Y photographers, such as Arthur Tress. But there was nothing unconscious or accidental in any of Arthur’s images. Their visual-effects were always ingeniously calculated. As for donating Photography Archives to the New York Public Library, some seasons ago I offered my INFOTOGRAPHY™ ArtsArchive Photo-Collection—now numbering some 300,000 images in slides & prints— to the NYPL Photography Collection. The then-serving Photo-Curator—having inspected some of my slide-volumes at my former Photo-Agency—told me: "I cannot imagine anyone not wanting to have your archives!" The Gift was going forward, with the blessings of the retiring director, who knew my photographic-work & my previous donations of Joe Orton & WH Auden manuscripts to the Berg Collection. Suddenly, all of the Archive was rejected by an Acting-Director, who noted there wasn’t enough money to keep the Library open on Mondays. So the NYPL could hardly service my INFOTOGRAPHY photos. It is costing a great deal of money to digitize all those prints & slides, but thousands of these images will be available online in time on ArtsArchive.biz. But I ran out of film & could not return to San Francisco—from Lake Tahoe—until the following Sunday. Something amazing had occurred: all over the lawns & even atop large rocks, semi-naked girls & boys were sunning & kissing & groping. Suddenly that Summer, it was the Summer of Love! The Haight-Ashbury became a Destination, not just a Muni bus-stop. Pop & Pot seemed to be everywhere. When I interviewed the SF poet Michael McClure for After Dark, he treated me to some odd observations, as well as to Pineapple-Chunks & a Joint. We talked about his Jean Harlowe/Jesse James play & frogs jumping up & down in Grand Central Station, chortling over & over: "Crunch-hammers, Crunch-hammers!" Beat Poet Allen Ginsberg—later a Brooklyn College colleague—& his chum Peter had a cabin in the Sierras not far from my folks’ ranch. Nearby, on the rattlesnake & poison-oak-infested banks of the Yuba River, Hippies were living in Caves! I wrote about these scruffy Free-Lovers for LIFE magazine’s The Scene feature. Actually, LIFE gave The Love Generation a lot of coverage. Now you can relive all this—and much more, too—from Frisco to Carnaby Street, from LSD to Kent State—on two floors of the Whitney Museum, which is now celebrating its own Summer of Love some four decades after the fact! There’s a Free & Important "Keeper," a multi-fold poster with a Psychedelic Chronology of Art, Protest, & Whatever… Good for Nostalgia-Time, but even better for those who were too young to be Along for the Ride. The Vietnam Protests, the Psychedelic films, the Be-Ins, Woodstock, Happenings: it’s all on tap at the Whitney. My favorite Psychedelic Installation, by the way, is Abdul Mati Klarwein’s Views of Aleph Sanctuary, madly complicated & colorful designs, lit from behind in a kind of translucent glass-cubicle.